Saturday 10th November. FREE admission. FREE tea and coffee before 11am. Friday 21st September at St Bridget's Centre, St Bridget's Lane, West Kirby. Doors open 7.00 pm for 7.30 pm start. 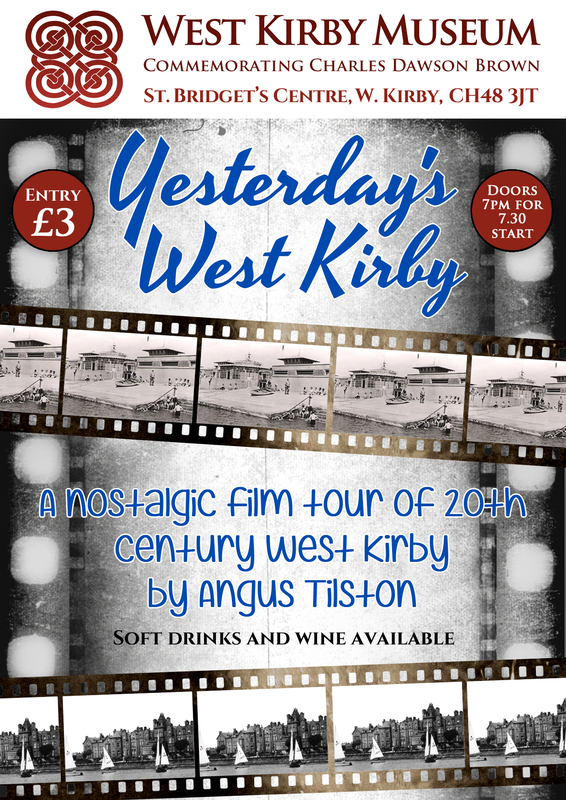 "Yesterday's West Kirby - a nostalgic film tour of 20th century West Kirby" by Angus Tilston. Admission £3. This year’s Wirral’s Heritage Open Days Programme once again features West Kirby. On both Saturday 8th and Saturday 15th September (10 am - 4pm) visitors can see inside St Bridget’s Church, with its wonderful Kempe stained glass windows and the pre-Norman ‘hogback’ or visit the Museum (located in the Parish Centre), currently housing a special display on ‘140 years since the coming of the Railway’. They can also join Guided Walks round Ashton Park (8th Sept) or West Kirby Old Village (16th Sept). Elsewhere in Wirral the Open Days programme offers the opportunity to see inside scores of heritage buildings or join guided walks round a wide range of historic landscapes. See: www.wirralhistoryandheritage.org.uk. "Exploring the Flintshire Coast" – an illustrated talk by Lorna Jenner. Doors open 7.00 pm for 7.30 pm start. With Heather Chapman. Meet at the lych gate of St Bridget's Church at 10.30am. Booking is essential as numbers are limited. See Wirral History and Heritage Association booklet. Museum open 10am – 4pm for Earthfest at St Bridget's Centre. Refreshments available. An illustrated talk by Martin Harrison Tickets £3. 7 for 7.30pm at St Bridget's Centre, West Kirby. St Bridget's Centre 10am – 4pm. 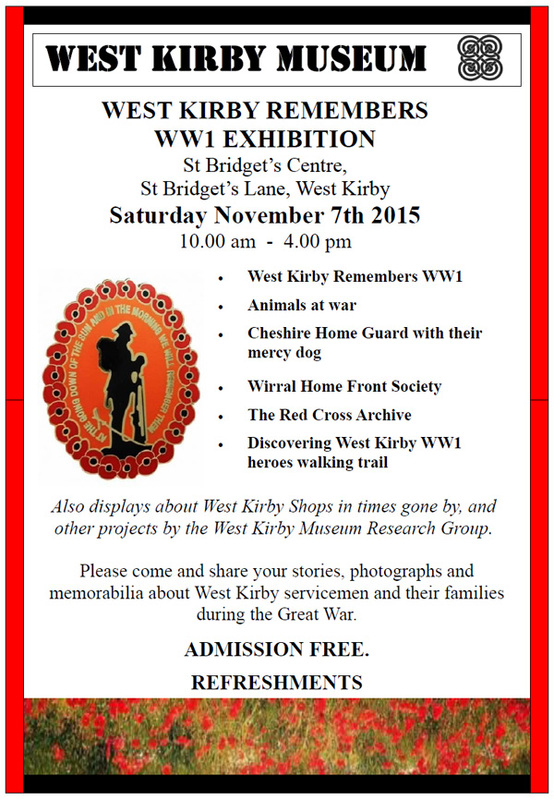 An Open Day with free talks and numerous exhibitions about West Kirby in WW1, Animals at War, The Somme etc. 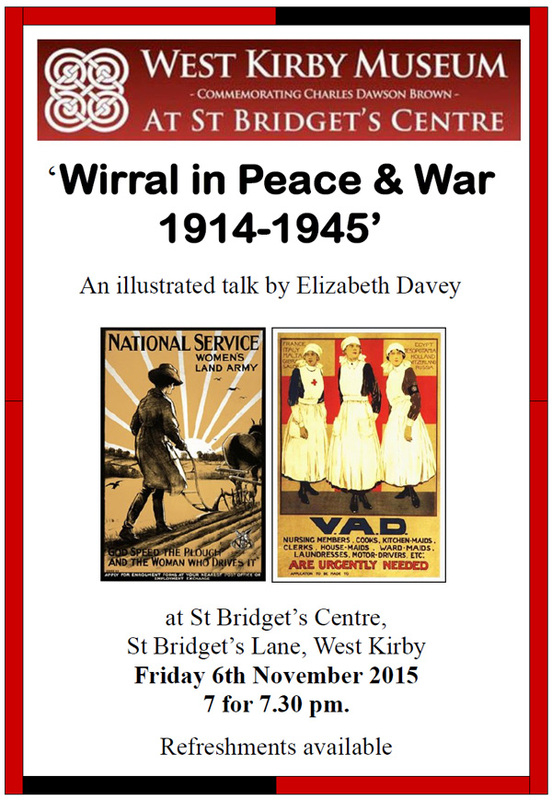 The Wirral Home Front Society, The Cheshire Home Guard and the Red Cross will be in attendance. There will be access to a database about the local casualties of WW1 and displays. 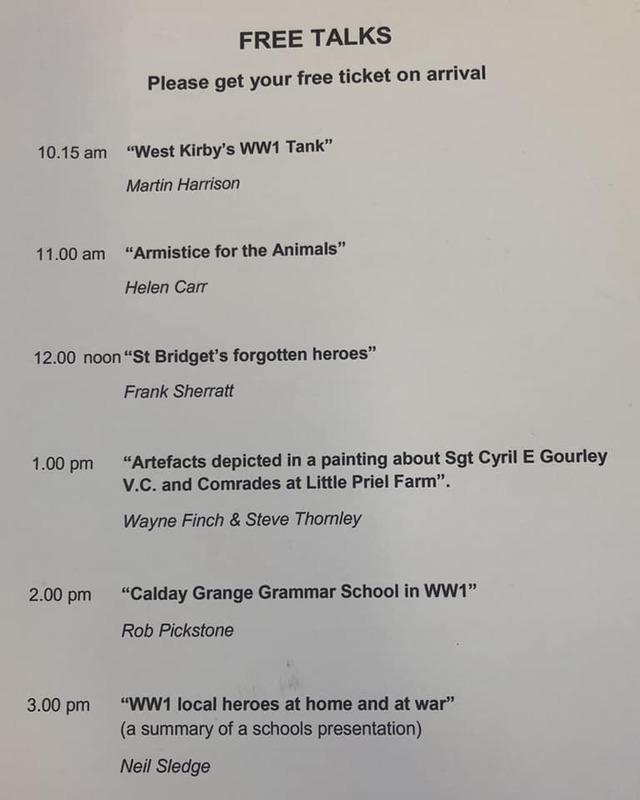 Throughout the day there will be a series of free short talks about WW1 (numbers limited, book your free ticket on the day). Entry is £5 for adults, £2 for children & seniors. An illustrated talk by Carol Hunter. 7pm for 7.30 at St. Bridget's Centre. West Kirby Museum Research Group have been busy finding out all about the old district of West Kirby and Hoylake. 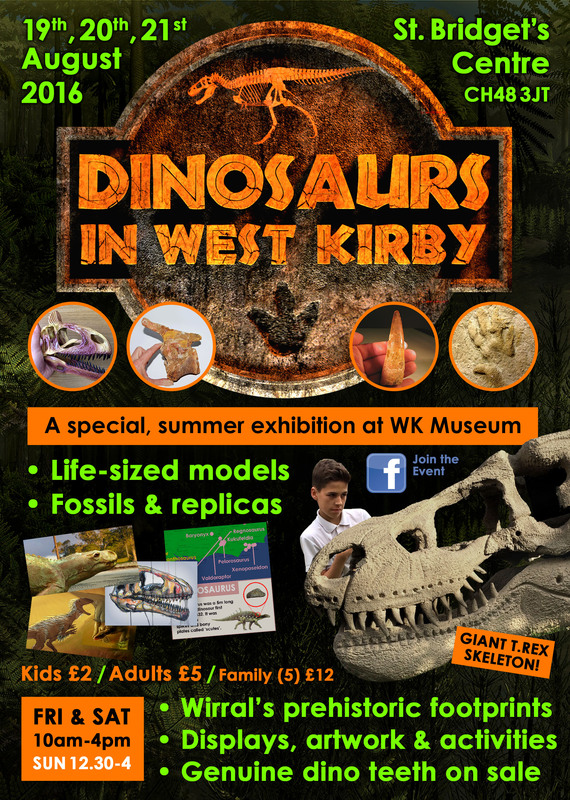 From 18th April to 30th April there will be an exhibition in West Kirby Library showcasing our many projects. 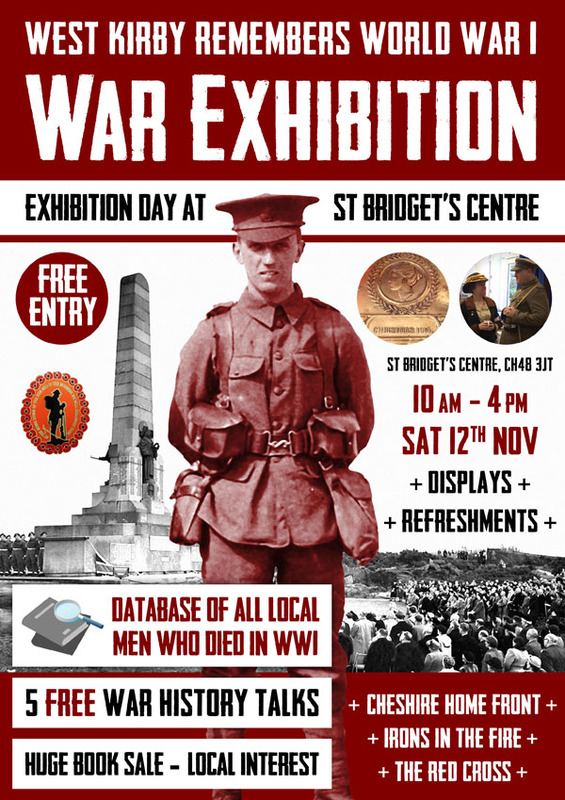 Some of the displays will include – West Kirby Shops in times gone by, West Kirby Remembers WW1, West Kirby men at the Somme, Early transport, Victoria Road and surrounds, Hoylake Baths, The Dale Estate and Sandhey Estate. This is a free event and everybody is welcome. If you have any memories or photographs to share please bring them along. A member of our team will be attending the display between 10 and 12 daily. Heather Chapman will be giving an illustrated talk titled “West Kirby Shops in Times Gone By” at West Kirby Library on Thursday 21 April at 2.30 pm. Book your free ticket (limited numbers) at West Kirby Library. 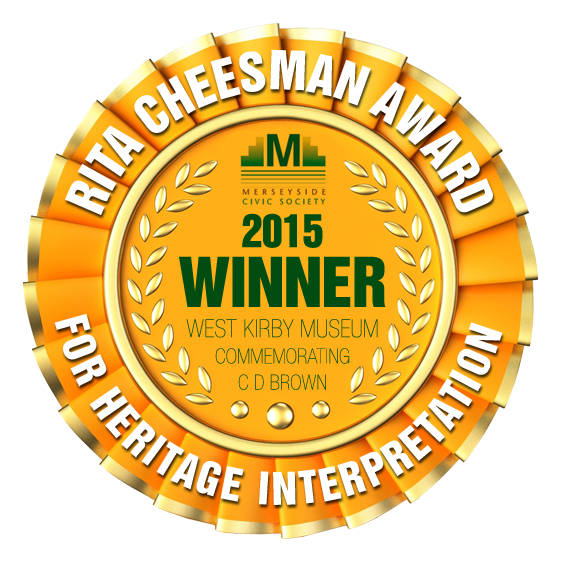 We are pleased to announce that West Kirby Museum is to be the recipient of the Merseyside Civic Society's Rita Cheesman Award for Heritage Interpretation, 2015. This biennial Award is given in memory of Mrs Cheesman (1918-2011), who was a pioneer Merseyguide and later a Blue Badge Guide and thus practically involved for many years in interpreting Merseyside's Heritage to local residents and visitors alike. The award was made possible through generous donations made by Mrs Cheesman's family and friends. An illustrated talk by Gavin Hunter. The Museum will be represented at Birkenhead Town Hall. Admission free. 10.00 - 4.00 pm. 7 for 7.30 pm at St Bridget’s Centre. St Bridget’s Centre 10-4. 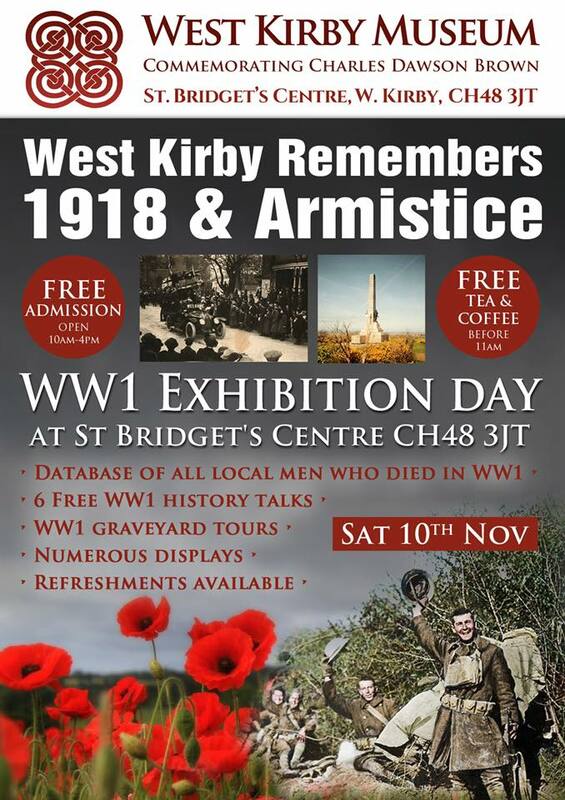 The exhibition is all about West Kirby during World War 1. 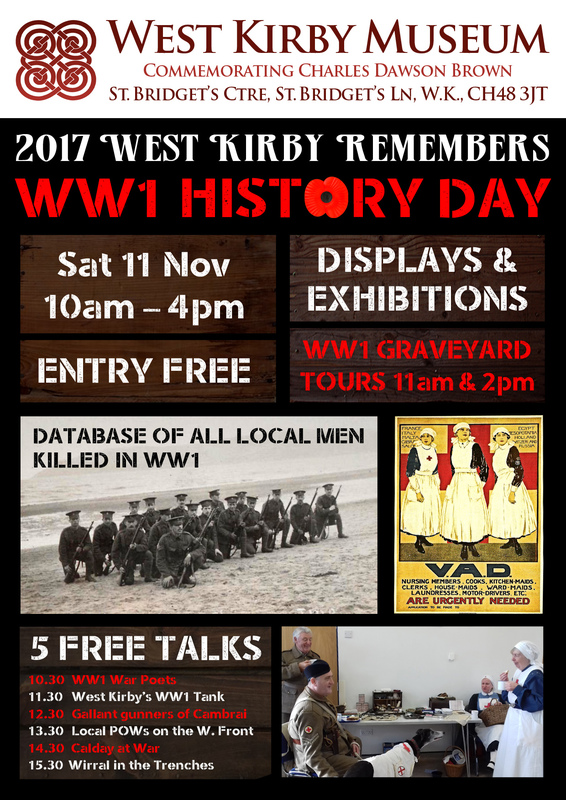 This is an opportunity for local people to share their stories, photos and memorabilia about West Kirby service men and their families during the Great War. 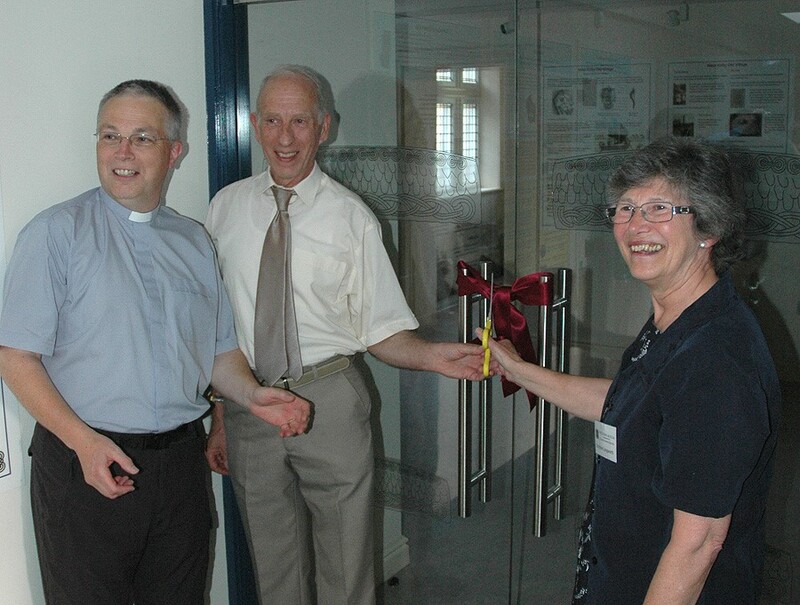 Friends of West Kirby Museum. Informal 1st Birthday Party /"Annual General Meeting" (no long speeches, no voting ! ), to hear reports on progress and events during the year (and, perhaps, hints of things to come). A celebratory social event, with nibbles and some liquid refreshments, plus live music. Museum open from 10-4. Hands on activities for all the family. Learn how to be an archaeologist and take part in the Time Team experience. Hands on activities for all the family. Popular local historian, Gavin Hunter, will give an illustrated talk about “The historic villages of Wirral’s Dee coastline”. The talk covers the history of the ports and villages of Wirral’s Dee coastline from Chester to West Kirby following the decline and fall as the river silted up and changed it’s course. Sep 6	2014 -	Heritage Day at St Bridget’s Centre 10-4. THE BIG HISTORY BOOK SALE. Hundreds of local history books for sale at discounted prices. VISIT OUR MUSEUM, Church open all day, morning guided tour of the church (booking essential Menai Dillon 07778391919), see the Hogback Stone, hands on activities for all the family, displays of old West Kirby, West Kirby Remembers World War One Exhibition. The first three months of the Museum have been more successful than we could have hoped, with over a thousand visitors across the different events and days we have been open. Our initial Friday slot was only available during the summer holidays and after the resumption of the school term the museum's committee was anxious to arrange new regular opening times. We are extremely happy to announce that St Bridget's Centre Management Committee has approved our application to open the museum every Saturday from 10am to 1pm and this arrangement will begin on 23rd November 2013. This regular day every week will be memorable for publicity purposes and bring a stability to the perception of the Museum's existence. We hope that people continue to spread the word about the Museum and tell friends and family that there is fascinating local history on their doorstep. 15th July 2013 - Successful Opening Weekend! Following our Official Opening on Friday night, an incredible 862 visitors attended our weekend of celebrations. We wish to express our thanks to everyone who supported us, especially: Dean Paton of Big Heritage for the Viking boat and coin striking, Gina Couch of National Museums Liverpool for the hand-axe polishing and for being a Viking along with Diane Goodier, and Nathan and Katherine for helping as demonstrators. We couldn't have done it without members of the Research Group who manned exhibition tables for varying periods: Val Frost, Carol Boshell, Keith Hatton, Susan Bunni, Judy Hall, Christian Minett. We are grateful to Diane & Eryn Morris, Sarah Marshall, Suzanne Abberley and Gillian Ingram who helped with the Time Team Experience. Well done everyone! 19th June 2013 - Less Than One Month To Go! We are pleased to announce that the Museum will have an opening weekend of celebrations on Saturday 13th and Sunday 14th July after which it will be open every Friday afternoon throughout the summer, plus one Saturday a month. The opening will form part of the Festival of Archaeology which is a national event coordinated by the Council for British Archaeology to provide opportunities to investigate the field and meet experts. Monday 4th saw a fundraising talk by Heather Chapman on St Bridget's School in the Victorian Age. It was extremely well attended and boosted our membership by another 18 people to a total of nearly 100 "Friends". The event raised a grand total after expenses of £348.50. On Twitter we now have 630 followers and 70 Likes on Facebook and we would like to thank everyone who has followed, re-tweeted, shared and most of all donated. Everything helps. On Friday 8th we will be having our first Friends Meeting where there will be discussions on all aspects of the museum and research. 2013 will be an exciting year for the Charles Dawson Brown Museum, when the newly refurbished museum will open to the public on a regular basis. The Museum is making good progress. The stones are now all mounted in the original old museum. The bier, sun dial and two display cabinets are in the second room and we are presently working on labels and wall display boards. We have not yet decided on the opening date and are hoping it will be close to Easter. We now have 72 members in our Friends Group and we will be having a meeting of volunteers in the near future to discuss opening hours and the work of the research group. Our next event is on Monday 4th February at St Bridget’s Centre. See information left. Heather is researching the history of St Bridget’s School, which began in 1825. Please will any former pupils with memories or photographs to share please contact Heather on 0151 625 7013 or thechappies@btinternet.com. Any photographs will be copied and returned immediately. Many thanks for your continued support and very best wishes for 2013. We have started mounting the exhibits in the museum with the help of a professional museum exhibition team. Some pieces have required conservation work before mounting, including the funeral bier and most of the stone items. There is a small team preparing the text for the information labels and this research is continuing.